book your child’s places now – call the Den on 07708596742! Hardys Den is where children have fun and gain new opportunities & experiences whilst parents have peace of mind knowing their child is in safe hands. We are also here to help parents and carers whose working or training hours lead to difficulties for out of school hours childcare. We aim to provide good quality, affordable childcare for parents who are working or training, and also for parents who feel that their children would benefit from attending the club and the opportunities that we offer. The clubs create an environment in which children can enjoy developing, growing and learning together. Our philosophy affords both children and parents the opportunity to fulfil their own aspirations and potential. Play is the essential part to every child’s learning and you can be assured that our clubs have well trained and caring staff to provide excellent quality, high staff to child ratios and a happy, fun-filled environment. All activities are age appropriate and we aim to meet the needs of all children attending the clubs. We strive to provide equipment and activities which promote non-stereotypical images and traditions. We hope to raise children’s awareness of today’s society through play activities, celebrating festivals and displaying positive images around the playrooms. Activity programmes are developed by both staff and children and include a wide variety of opportunities. The programmes are not set in stone however as children are always given the opportunity to choose activities which may not already be included in the planned programme, adapting and developing the resources we have available. 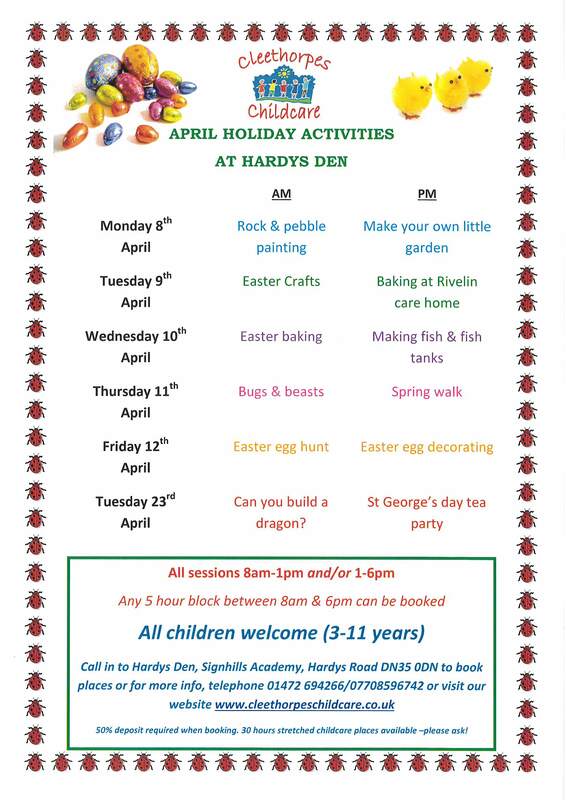 Hardys Den is open for children aged 3-11 years (term after 3rd birthday) for 49 weeks per year. Whilst we are open to all children, priority for places is given to Signhills Pre-school, Infant & Junior Academy children as we are unable to collect or drop at other school sites. Children from other schools are especially welcomed to join us during school holidays. Flexible bookings available on a first-come-first-served basis. Maintaining high adult to child ratios for children of all ages (1 adult to 8 children aged 3-11 years), excellent quality of care and terrific fun activities including cooking, indoor and outdoor games, themed sessions, local and wider outings, special visitors and a great many crafts. Pre-school children are taken over to Hardys Den by Pre-school staff. Infants children are collected from their classrooms and brought into the clubroom. Junior children make their way through school into the clubroom. Includes healthy fresh home-cooked tea for children staying beyond 4.00pm – menus are displayed in the clubroom. We cater for special dietary requirements, just let us know! We have updated our healthy eating tea time Menu’s check out what we offer. Full or half day (5 hour blocks) places, discounts for siblings and full or half day bookings taken over 5 consecutive days. Breakfast and tea provided, children are requested to bring their own pack-up for lunch. Children can make and join friends whilst they take part in outings, art, large and small crafts, themed weeks, music & dance, circus skills, games, cooking and baking, role play, special visitors, den making, parachute play, and of course lots of time for free play!